Here on the east coast, it seems like winter is not leaving anytime soon. Because of that, I purchased this cozy coat from Zara and it was love at first sight. I bought it online without having to try it on online because even if it was over-sized, I would still wear it. When it came it, it was just as I imagined. This coat is honestly the softest coat I own...I could even sleep in it if I wanted too! What I Am Wearing: Dillon and I made a quick stop at Playa Bowl because I was craving an acai bowl so we turned it into a quick photo shoot. I put on a pair of leggings with a white pullover underneath my new cozy coat. This coat will probably be one of my staples for the rest of the year or two when the weather is still chilly. I kept it minimal, which I tend to do on the weekends when I don't have any plans. It has been a tough week but the weekend and acai bowl made it better. If you want to keep up with the minimalist trend, it is pretty easy to do! Stick with solid colored apparel, preferably neutral colors such as black and white. This acts as your foundation and then top it off with a grey statement coat or simple over-sized coat. Now that I am working a full-time job, I am always looking for pieces that are versatile and pieces that will last me several years. Sure I still buy pieces that are one trend but not as often as I used to. It is time to mature my style and I am doing it one piece at a time. I am always on a budget and I am sure most of you are too. So do not be afraid to spend a little more than you do on pieces that you think will last you for years to come. I will admit though, I did get this coat for a great deal of less than $40! Most of Zara's coat are $99 or more. Currently, the jacket is now out of stock but it looks like they will be adding more to inventory soon so be on the look out! For now, you can check out similar styles available below. Hello beautiful, I love the look is very chic and comfortable. Very chic casual styling! Love the colour of your coat. Love your chic, minimal style! You look so beautiful! This is so pretty! I love this post as grey is one the colors I can't stop wearing! 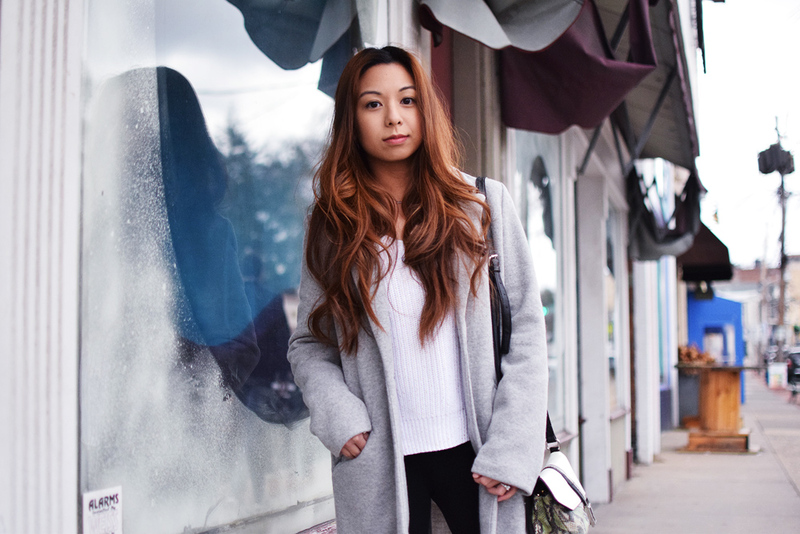 You really can't go wrong with grey sweaters, they're so versatile and looks well with almost any styles of outfits. This minimalist is such an adorable look on you dear. Love the python print bag too, it's such a cool touch of differnt texture and color! I LOVE this look on you and especially your long luscious hair... reminds me of mine circa early 2017!